Symmetrical recycler. Fixed time ranges: 0.1-3 secs., 1-30 secs., 0.1-3 mins or 1-30 mins. 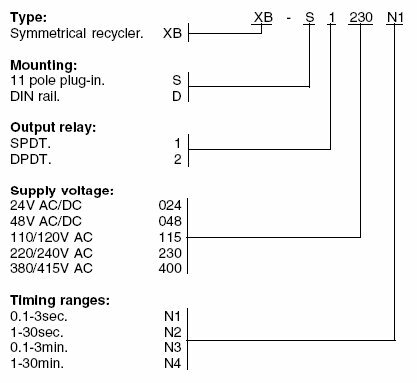 The time range is selected using a rotary switch on the front side of the relay. The relay is available in different versions for AC and DC supply voltages. Single or double output relay, relay energizing indicated with LED. Versions available for assembly on DIN rails or 11-pole plug-in mounting. When the supply voltage is connected and the pause time has elapsed, the relay energizes. The relay remains energized for as long as the pulse lasts. This sequence is repeated until the supply voltage is disconnected. The pause and pulse periods have the same duration.